Glazed nuts mix delivers a rich balance of creamy vanilla paired with pomegranate-flavored apples. 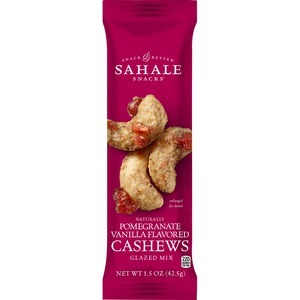 Whole cashews are dry-roasted to maintain their heart-healthy fats, protein, vitamins and minerals. Non-GMO ingredients are verified to be gluten-free. Grab-and-go packaging is just the right size for snacking at your desk, on the trail or while you're running errands. Snack mix is perfect for boosting office morale, impressing visitors and more.